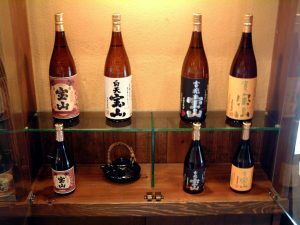 This sheet can be used for a three-bottle tasting with products from the vaunted Nishi Distillery in Kagoshima Prefecture. The three bottles are Hakuten Houzan, Kicchou Houzan, and Tomi no Houzan. This is an enjoyable tasting because they are made with the same potato varietal (koganesengan), but three different types of koji. As you can see by the labels, Hakuten Houzan is made with white koji, Kicchou Houzan with black, and Tomi no Houzan with yellow.